Designed like a Mediterranean village, The Blue Lagoon Village is a newly build luxurious complex right next to a sandy beach on the Aegean island of Kos. At only 10km from the centre of Kefalos Town, 3km from famous Paradise Beach, 7km from the airport and 30km from Kos Town, the hotel is ideal for families, couples and incentive groups, offering a comfortable and tranquil holiday for adults and safe playing areas for children. The resorts 357 spacious guestrooms offer upscale accommodation with all modern amenities, including bath/shower, bathrobes/slippers, coffee/tea facilities, hairdryer, direct-dial phone, Internet data port, a/c, mini fridge, safe, Satellite TV and balcony or terrace mostly opening to splendid garden pool or sea views. Adapted rooms for guests with special needs are also available. At Blue Lagoon Village you are spoilt for choice with 7 restaurants – including a Chinese Restaurant and an Italian Restaurant - 5 bars and lounges, each one with a different theme, location and décor. 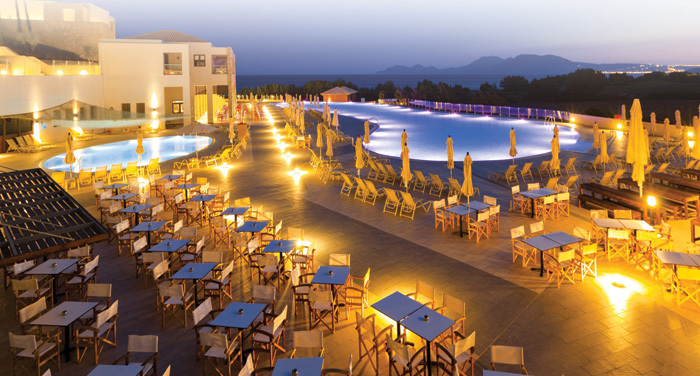 Several of the restaurants and bars allow for sweeping vistas of the Aegean Sea and the most romantic sunsets. There are 5 outdoor pools in the hotel with Jacuzzi and water jets, a children’s pool and a Spa offering a wide range of treatments. Other amenities include complimentary sun loungers and parasols at the hotel’s beach and pools, super market, guest parking, lounge with card games and home theatre TV room, Internet Corner & PC games, meeting room, hair studio, table tennis, courtesy room, doctor’s office, children’s facilities and playground.